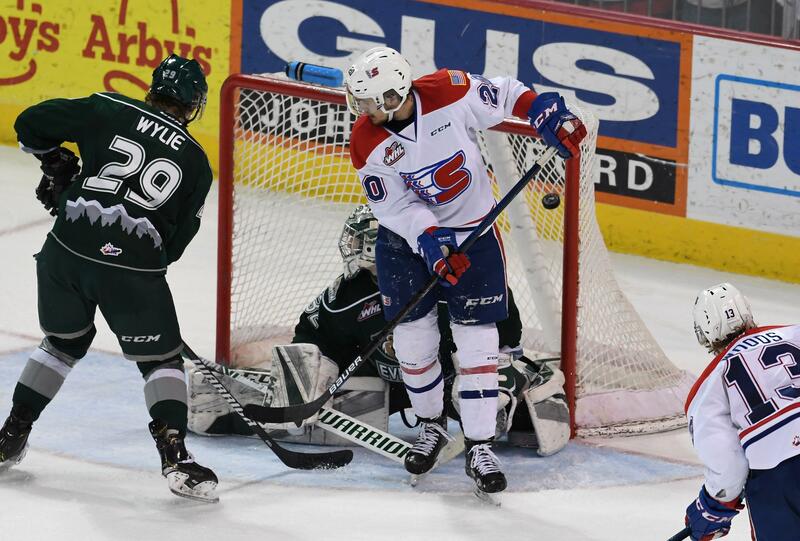 Down 3-0 to the Spokane Chiefs in their second-round playoff series, the Silvertips looked exactly like a desperate team with their season on the ropes. The Silvertips also looked like the team that won six times out of eight tries against the Chiefs in the regular season as they lived to play another day thanks to a 4-1 win Saturday. The Chiefs lead the series 3-1. Dustin Wolf stopped 27 shots while his counterpart, Bailey Brkin, topped 23 for Spokane. Connor Dewar had two goals and an assist to lead the Silvertips. The final score looked like it’d be closer after Riley Woods scored with 3 minutes, 6 seconds to play to get Spokane within 3-2. But after a lengthy conference, the officials waved off the goal and ruled Luc Smith made incidental contact with Wolf. Instead of being within one goal and having some momentum, the Chiefs remained at a two-goal deficit. Beyond the controversial call, the Chiefs dug themselves a hole in the first 10 minutes of the game as the Silvertips took advantage of two Spokane miscues to build a 2-0 lead. First, Ty Smith sent an errant pass that was intercepted by Max Patterson, who dished the puck to Robbie Holmes for the opening goal at 6:21 of the first. Then, Bobby Russell took a tripping penalty and Zack Andrusiak made him and the Chiefs pay with a power-play goal at 9:47 of the first. The early deficit meant the Chiefs were constantly playing catch up. Doing that against the U.S. Division Champions is not a preferred recipe. Everett also applied lots of pressure and spent a lot of time in the Chiefs’ zone. The Chiefs showed some life late in the first when Adam Beckman put home a power-play goal with 1:07 left in the opening frame. It was Beckman’s fifth of the postseason. But the momentum didn’t carry over into the second. Connor Dewar scored on a nice one-timer at 6:41 of the second to extend Everett’s lead to 3-1. The Silvertips kept the pressure on Spokane all period and had two good shorthanded scoring chances. Luc Smith nearly got the Chiefs back in it late in the second when he intercepted a pass and was all alone in front of Wolf, who was at the top of his crease and didn’t give Smith much at which to shoot. Lambert shuffled the forward lines in the third period to try and get something going. It seemed to work, as the Chiefs applied more pressure on the Everett defense but could not find the net. “We wanted to see if guys could get going,” Lambert said. The Chiefs were officially 1 for 3 on the power play, though one of those power plays only lasted 15 seconds at the tail end of multiple penalties by both teams. Everett was 1 for 5. The Chiefs couldn’t get the series sweep, but they still have a chance to close it out at home tonight when the puck drops at 7:05 p.m. Published: April 12, 2019, 11:12 p.m.